You are here: Home › Salut! 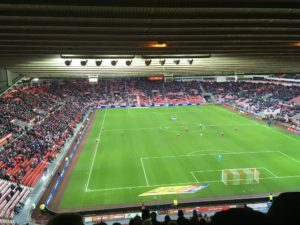 commentary › Vote to rename the Stadium of Light south stand. Then on to North, West and East? Maybe Bradley Lowery, which would have been my choice, is a name for one of the other three stands. But SAFC have made a decent first response to popular will, announcing that the loudest of the four, the south stand, will become one of these: The Roker End, The Wearside End, The Colliery End and The Raich Carter End. A fans’ vote will decide the matter. My own preference, just ahead of Raich Carter, would be The Roker End, geographically sound and evoking the old place when older fans spent every other Saturday, savouring the glories of the Roker Pie Shop or munching “tanner a bag” peanuts. My vote is already cast. 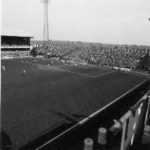 Raich should get the West stand since from there you can – I think – point in the direction of the Hendon of his boyhood (never forget that his son, also Raich, donated his HAWAY award – for best “Who are You?” interview of the 2013-14 season – to the sports centre there). Sunderland AFC has announced plans to re-name the Stadium of Light’s south stand. Supporters are to be given an opportunity to name the stand from a short-list of four suggestions from a survey in the summer led by the Sunderland supporters’ group, Red and White Army (RAWA). The RAWA have been working closely with Sunderland AFC on a range of initiatives to improve the matchday experience and one thing that was very clear from the comprehensive survey was that supporters felt the Stadium of Light needed a greater sense of identity. In response to this, Sunderland AFC confirmed that the south stand, which is the stadium’s popular singing end, would be given a new name, to better resonate with supporters, the club and the city. Chairman of RAWA, Andrew Hird said “When 10,000 supporters complete a survey, you’re naturally going to get a wide range of suggestions an all manner of things, including the naming of stands. However, it was clear that the themes of tradition, history and sense of place were of utmost importance. Sunderland AFC’s executive director Charlie Methven said: “Sunderland both as a club and a city has a strong and proud identity and we want our home, the Stadium of Light, to reflect this. “Since we came to the club in the summer, putting supporters at the forefront of everything we do was our utmost priority. They are the lifeblood of this football club. Giving our supporters the opportunity to choose the name of the stand is important, this isn’t simply about the club making a decision, it’s about reflecting and actioning the wishes of supporters. Supporters can cast their vote at this link to choose the south stand’s new name. The four names on the short-list are: The Roker End, The Wearside End, The Colliery End, and The Raich Carter End. The Roker End – a homage to Roker Park and the famous Roker Roar, a term still used across football to describe the intense atmosphere Sunderland fans are famous for. Photo courtesy of therokerend.com which kindly permits reproduction of its image here. The Wearside End – celebrating the location of the Stadium of Light on the banks of the River Wear which has been a focal point and lifeblood of the city. A nod to the proud history of shipbuilding and other industries founded on the river. 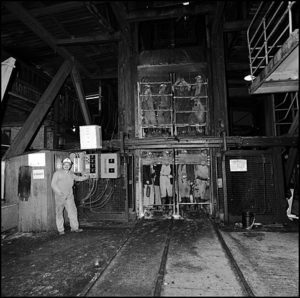 The Colliery End – the Stadium of Light is located on the old Wearmouth Colliery. This name is a tribute to the great mining tradition across the city and wider communities across Durham and South Tyneside. The Raich Carter End – a name from Sunderland AFC’s glorious past who was Sunderland born and bred. 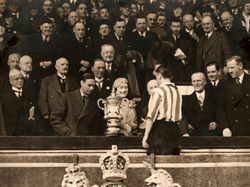 He lifted the FA Cup in 1937 and was the youngest captain to win the First Division title (the equivalent of today’s Premier League). I hope this doesn’t sound insensitive but in my opinion if all the stands are to be named they should refer to the club’s or the region’s heritage. Bradley was a lovely little boy with an infectious smile who touched the hearts of millions through his family’s association with the club. Often overlooked in his battle with his illness and somewhat overshadowed by JD’s relationship with him was and is the fortitude shown by his family who whilst battling with their own grief found the strength to firstly fight to raise the funding for treatment for their son, then to raise awareness of the extent and effects of neuroblastoma and other childhood cancers and through their work in setting up the Bradley Lowery foundation find the energy to advise and support other families who are faced with similar heartbreak. Gemma, Carl and Kieran are real heroes but rather than name a stand in Bradley’s honour, would not a facility at the stadium along the lines of the Nathan Shippey sensory room be more meaningful and appropriate. I’m not sure what form this could take but I would hope that if it were to be considered the family would be consulted to make it a fitting tribute. Perfectly respectable viewpoint, Malcolm. And I do see Bradley as a symbol of broader suffering. This is an exchange at Twitter with Roker Report’s managing editor after I mentioned the above piece in a tweet. . .. I think if they do anything, it should be to name the family enclosure or even a yearly event after Bradley… could even designate an area of the stadium for children like Bradley, and put his name to that. It’d be a nice gesture, but this isn’t the right way to commemorate him.